That is, if you don’t count psychiatric hospital or house arrest. Ivan Nepomnyashchikh on release. Image: Navalny Team, Yaroslavl. 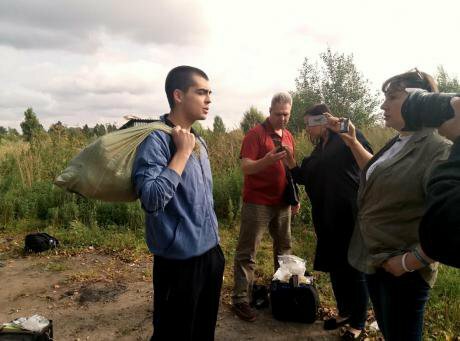 This week, Ivan Nepomnyashchikh was released from Yaroslavl Prison Colony No 1. In December 2015, Nepomnyashchikh was sentenced to 2.5 years in prison for participating in mass unrest as part of the Bolotnaya Square case. Three days before he was released, the prison administration once again placed him in a punishment cell. Nepomnyashchikh had been in solitary confinement on numerous occasions, especially after he, along with a number of other prisoners, complained of being beaten by prison guards. During his sentence, he spent a total of 58 days in solitary confinement. This means that, as of 24 August 2017, no one convicted in connection with the May 2012 protest on Bolotnaya Square is in prison. Approximately one month before Nepomnyashchikh, Dmitry Ishevsky was released from the same prison colony. However, the prosecution of Dmitry Buchenkov (who was not on Bolotnaya Square the day of the demonstration) continues. He is currently under house arrest. In addition, Maxim Panfilov, who was charged with taking part in the events on Bolotnaya Square and found by a court to be unfit to stand trial, remains in a psychiatric hospital in Astrakhan. Andrei Bubeev, a Tver blogger sentenced for reposting materials on social media, was also released this week. In 2016, Bubeev was sentenced to two years and three months in prison for reposting materials on the VKontakte social media website, and also for illegal possession of gun cartridges. The first case was brought against him at the beginning of 2015. An additional charge, which concerned only online publications, was brought against him after the first conviction. The grounds for prosecution was Bubeev’s repost of a text, “Crimea is Ukraine,” by journalist Boris Stomakhin, who is currently imprisoned, together with a picture on the same theme. After Bubeev was released from the prison colony, he was briefly detained at the railway station in Torzhok, along with his wife and two journalists. Gogol Centre theatre director Kirill Serebrennikov has been placed under house arrest. Outside the court where the hearing took place, people who came to support Serebrennikov were detained. Serebrennikov was arrested on the afternoon of 22 August. He has been charged with large-scale fraud (under Article 159, Section 4, of the Russian Criminal Code). According to investigators, Serebrennikov organized the theft “of at least 68m roubles, assigned in 2011-2014 for implementation of the Platform project.” Many cultural and artistic figures believe the case is fabricated and have expressed their support for Serebrennikov. The Investigative Committee began investigating the 2016 hacking of the Telegram account of a Navalny supporter. In April 2016, unknown persons hacked the Telegram accounts of activist Oleg Kozlovsky and Georgy Alburov, a member of the Anti-Corruption Foundation. The mobile phone text services of both individuals were switched off for a period of two-and-a-half hours, during which time the hackers requested Telegram to provide the secret authorisation codes for their accounts via a new device. The codes were sent by text. The activists are convinced that, before the hacking, the operator, MTS, without warning switched off their access to the internet and text messages. They believe the security services were behind this. Pavel Durov, founder of Telegram, takes the same view. Kozlovsky reported the alleged crime to the Investigative Committee. In March 2017, he received a response that the Committee had found no evidence of a crime. Kozlovsky appealed against this decision in court, and now the Investigative Committee is again investigating the allegations. Thanks to everyone who continues to support us. Find out how you can help us here.